Day 11: A look at one of the other Hurtigruten ships in Trondheim before some long sailing time down the coast to Kristiansund and Molde. Everything is now winding down as we spent the last full day at sea. 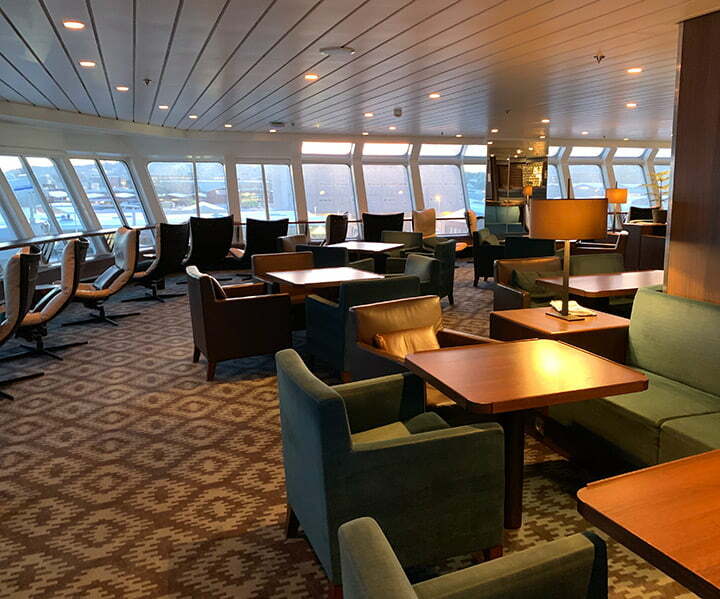 The deck was very quiet today and I think most people took the opportunity given by the two long stretches at sea to relax in their cabins or in the lounge with a book. 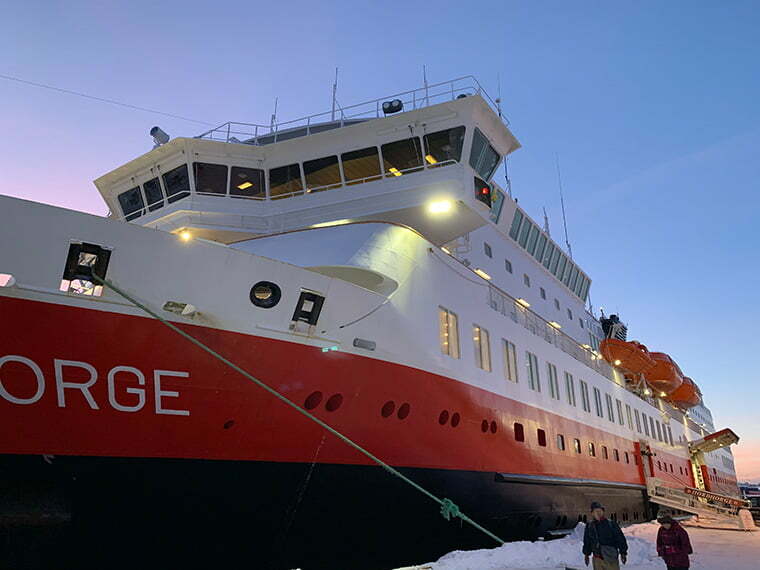 On both the northbound and southbound legs of the coastal voyage, Trondheim provides guests with an opportunity to visit other Hurtigruten ships. At the time of writing, the northbound ship docks from 6am to midday, while the southbound ship docks from 6.30am to 10am. 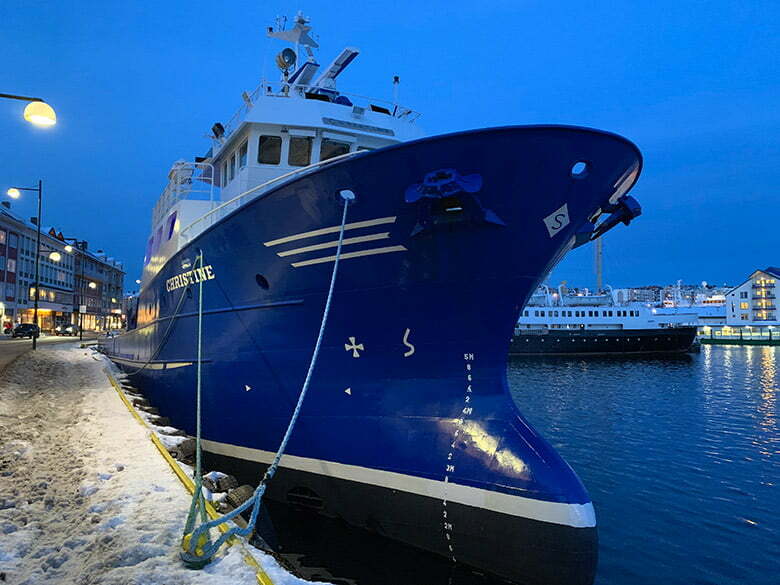 I've been really looking forward to seeing one of the newer ships to compare and contrast how things are there with the Vesterålen. 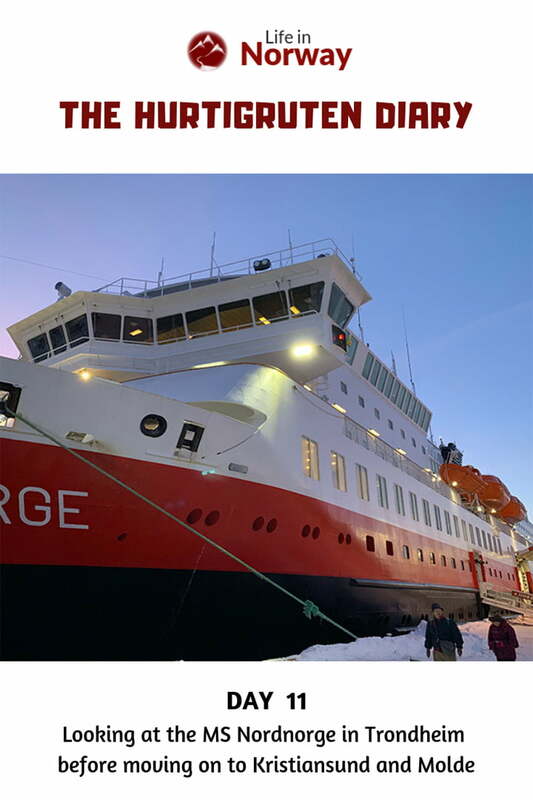 I spent 15 minutes looking around the MS Nordnorge which has a capacity of roughly double the Vesterålen. There's no doubting the ship was newer and the public areas had a more luxurious touch to them without being luxury, if that makes sense. There were more facilities including a bakery, a la carte restaurant, a much bigger shop, and a team of expedition leaders. While this might seem better, everything is geared up to encourage you spend more money. Having those options available but not being able to afford them isn't necessarily a good thing! One aspect I did like a lot was the lounges. 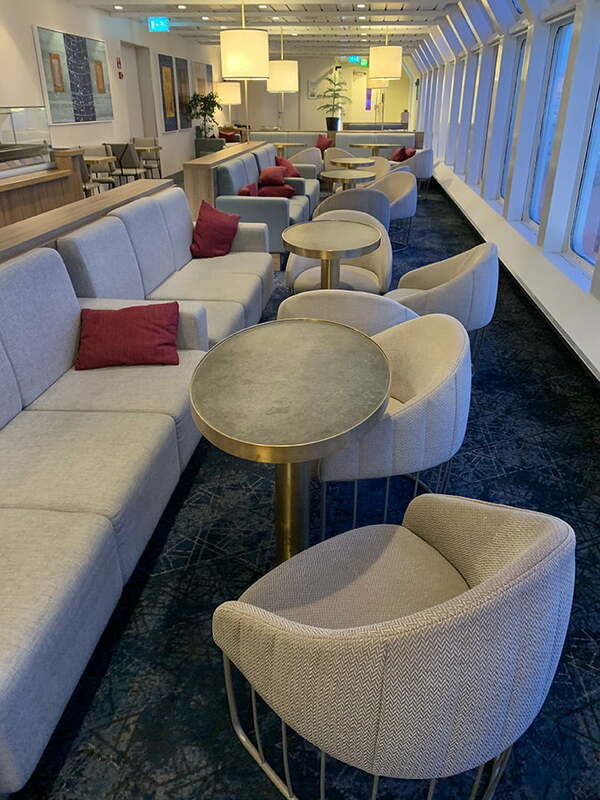 There were swivel chairs in the panorama lounge and more comfortable seating areas throughout the ship. 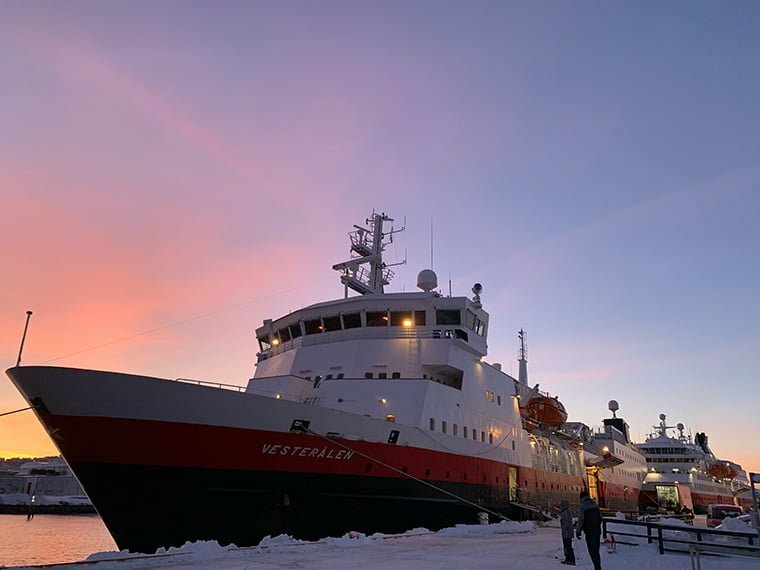 The Vesterålen is due to undergo a two-month refurbishment in October this year (2019) and it would be great if the furnishings were brought up to a similar standard. Let's wait and see! I saw many of my fellow Vesterålen guests taking a walk round the Nordnorge and those I spoke to agreed with me: we prefer the Vesterålen! 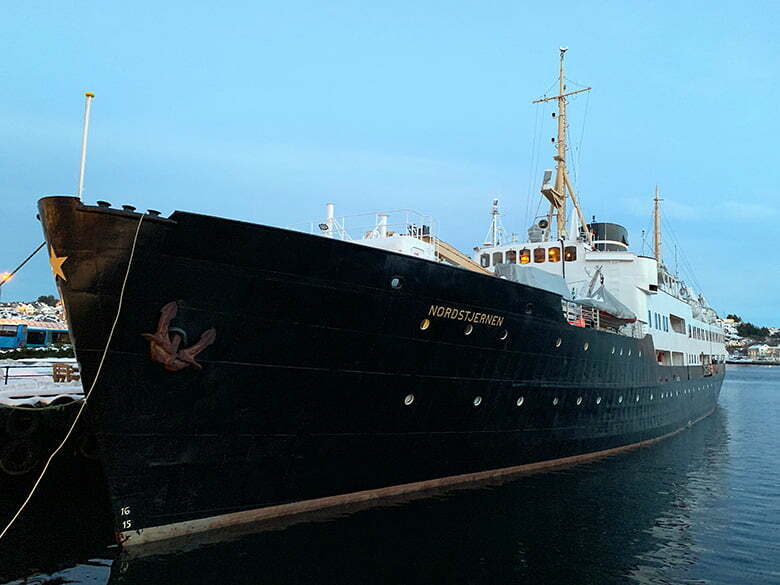 There's a traditional charm to the ship with nods to maritime heritage everywhere you walk. But most of all, the low number of guests means it's easy to meet people, bump into people you know everywhere, and get to know the crew. 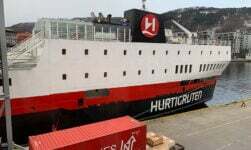 I can't imagine that being the same of any of the other Hurtigruten ships aside from the MS Lofoten. 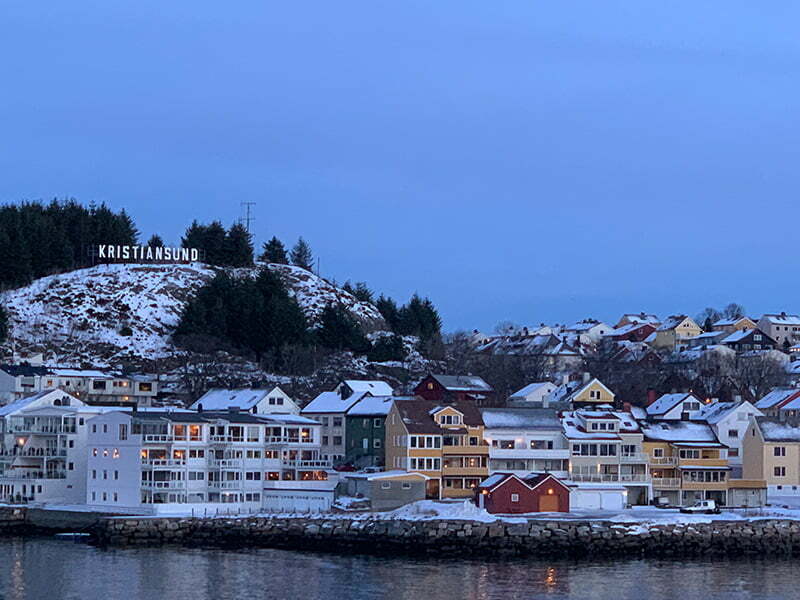 The coastal town of Kristiansund looked at its best in the blue light of the late afternoon after the 6.5-hour sail down from Trondheim. The scheduling of the trip has been pretty good in terms of making sure we get to see all ports in waking hours. 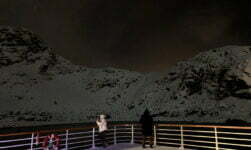 Perhaps the only two problems were seeing Lofoten in darkness twice (although the second time in moonlight was fabulous) and the short stop in Kristiansund. 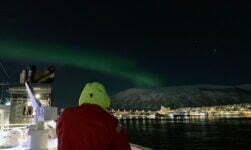 There's plenty to do in the town and although the Hurtigruten dock is very much in the city, half-an-hour isn't enough time for more than a quick wander. On the northbound journey the stop is 45 minutes, but doesn't start until late into the evening when everything is closed. Of course, the port calls have to be balanced with the needs of the cargo delivery and passenger ferry element of the service, so all things considered it's an excellent schedule for the winter months. I've talked a little about the food so far but not so much about dinner, other than calling out the excellent Arctic char. The final meal tonight was another great composition. 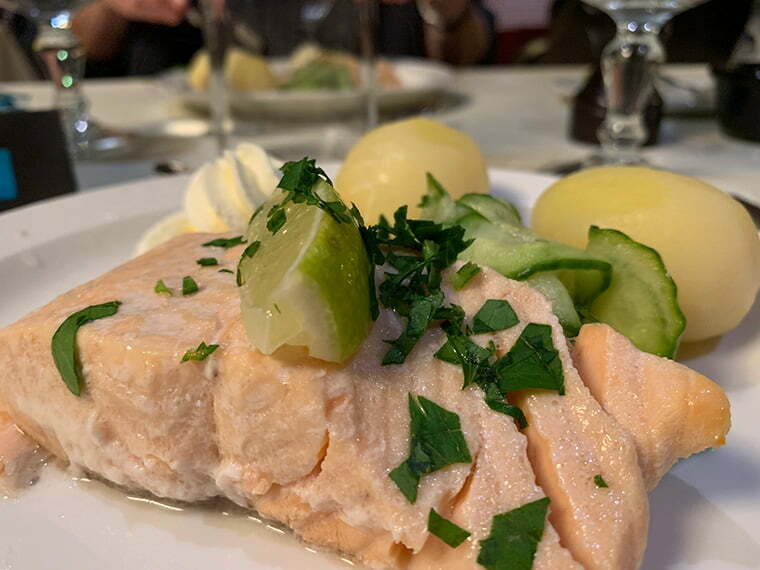 A creamy fish soup to start, baked salmon with a lemon-flavoured cream for the main, followed by a chocolate cream for dessert as my egg-free alternative to the Queen Maud's port wine pudding. Given that there are buffets most days for breakfast and lunch, you might think a three-course meal for dinner is overkill. It is a lot of food throughout the day, but the dinners have almost always been light. Lots of soups, fish, and occasionally rich but always small desserts. You'll notice the word ‘cream' in all three of my courses today (! ), but the whole meal felt light and well-balanced. That said, I'm dreading weighing myself when I eventually get home! The food in the restaurant has been outstanding from start to finish and I think there was only one dish in the entire week-and-a-half that I declined, simply due to personal preference. Another benefit of being on a smaller ship is that service is fast, and the wait staff get to know you and your preferences. We called at Molde for a half-hour tonight but most people seemed too exhausted to leave the Vesterålen for a look around, me included! We now have just three overnight stops remaining, with an early morning call at Florø before a final six-hour sail down to Bergen. But for many people, tonight marks the end. Our empty suitcases have been delivered and we must vacate our cabins by 10am in the morning, leaving a few hours of time for reading, some last photos, and of course, the goodbyes. Thank you so much for sharing your trip. I haven’t yet been able to view all your posts so I hope they will continue to be available on your site. David I subscribe to your weekly Life in Norway. I throughly enjoy it. This was especially nterestingbto me because we have visited Kristiansund many times. My daughter lives there wth her husband and two children. 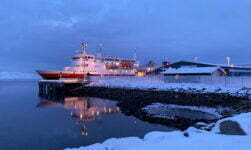 We have been to Molde, Trondheim and many other places in the area. We have been to Norway 25 times in 11 years. 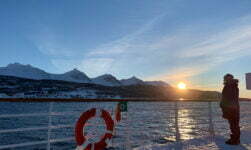 Thank you so much for this wintertime view of traveling the Norwegian coastline. 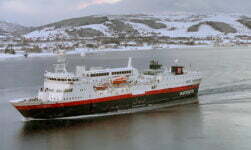 I’ve had the chance to travel from Tromsø to Kristiansund on board the Richard With in 2012 and from Tromsø to Mølde in 2016 on the Kong Harald. This past summer, a friend and I used the Hurtigruten like the locals, traveling from Bergen to Ålesund on the Nord Norge. The white lounge chairs, not as comfortable as you might think, but the green couch just around the corner from the one in your picture was a great place to stretch out and sleep overnight! We were unable to secure a cabin for just one night because we were traveling on the last Saturday in July, so as the evening wore down and the bar emptied we moved to the couches. All in all, there were about 15 or so travelers stretched out on the couches and chairs! A few days later we were on board the Kong Harald for a short sail from Ålesund to Mølde. Some day I’d like to travel the full circle in the winter. We did the trip from Bergen to Svolvær on the Polaris this past May. We loved the ship, the crew of course the food. I especially enjoyed the breakfasts. I loved seeing the contrast in your trip with the snow and the blue light of evening. Thanks so much for your wonderful story telling. I appreciate your thoughts.